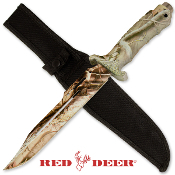 This survival combat knife features a razor sharp 8" stainless steel blade. The all-weather suregrip handle includes a steel tip window smasher. Includes nylon belt sheath.